So much of the pleasure of board gaming comes from moments of frisson, those exciting moments of suspense and anticipation before pulling a key card, seeing if an opponent has noticed your ploy, or, most commonly, rolling dice. There’s something just a bit more special about dice. They feel nice in your hand–their geometric symmetry and (I can’t believe I’m writing this) hand-feel are undeniably a tactile pleasure. Dice have always generated excitement, from Craps to D&D to [insert reasonably successful board game title here]: The Dice Game. I’ve heard of people disliking dice, but that seems to be a very selective, reasonable preference–”I just don’t want dice invading every eurogame”. Can’t argue with that. I don’t want chocolate cake for dinner and dessert. Usually. Dice are great, and popular enough that there’s a market for truly absurd products like multi-hundred dollar d20’s made out of extinct animal remains, but there’s an inherent contradiction in their use. Dice are particularly brutal randomizers. Unlike a deck of cards, there’s nothing stopping a string of bad or good luck where you roll the same thing over and over again. Dice are concrete and sudden, and the more they matter, the more exciting they can be. But the more they matter they more frustrating they can be. Variability is exciting, but also…variable. So when a game comes out, like Dice Forge, centered around the excitement of rolling dice, you expect that part of the game to be exciting. The trick that it pulls is quickly shifting those displays of excitement into long-term strategy. Is that a good trick? I’m not sure, but I think it’s necessary. 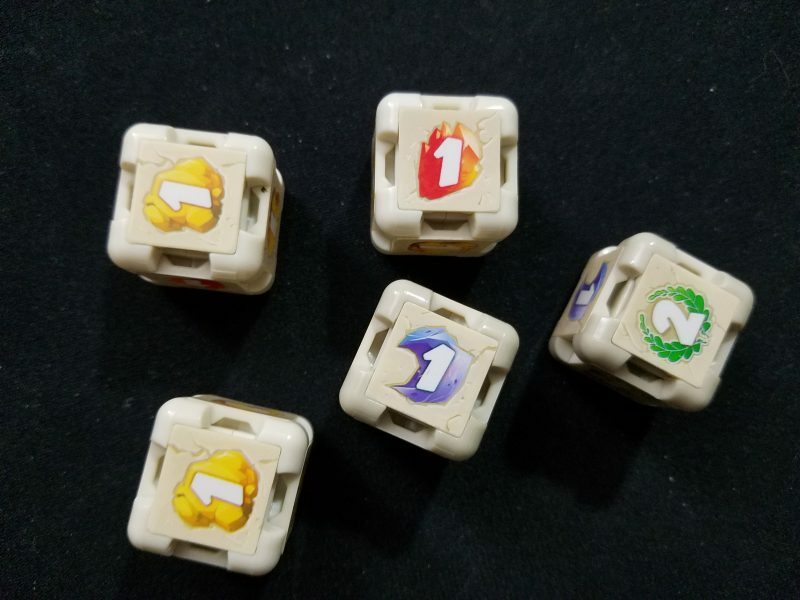 The entire conceit of Dice Forge is that you’ll be modifying your dice by replacing the faces on them. It’s a neat component innovation, and I’m actually quite surprised there haven’t been more games that use it, but it highlights that variability contradiction well: because Dice Forge wants you to actually gain the benefits of your newly acquired die faces, it makes you roll a lot. In a 4 player game you’ll be rolling a die a minimum of 72 times, and certainly more than that. It flattens out the expected results of those die rolls, which flattens out the excitement. Rolling a particularly good result doesn’t feel like a stroke of luck, it feels inevitable. I don’t think designer Régis Bonnessée had any other choice, though, and I’m certainly not going to fault someone for choosing strategy over excitement. But I think there’s a disconnect between how special acquiring cool new die faces feels and how un-special it feels to roll them. There are a couple exceptions to this, usually supplied through the card system, that will do something big like triple the result of your other die, but most of the time you’re hoping for a relatively marginal improvement over your previous turn’s roll. But is that really the game’s fault? If the die face acquisitions weren’t as exciting to acquire, I probably would have a lesser view of the game. Is it better to have a game that’s more cohesive, yet more bland? Probably not. All of that to say that Dice Forge does a great job of making me think long and hard about dice. It also makes me think about deckbuilding, as it exposes the nuts and bolts of the flow of most deckbuilding games shockingly well. Early good decisions snowball into better resource generation in the mid game, which turns into tough decisions of how to most successfully pivot into generating victory points for the late game. Making the resources so distinct (gold to buy die faces, and two separate resources for cards) really highlights what your dice do well and what they do poorly quickly in the game. 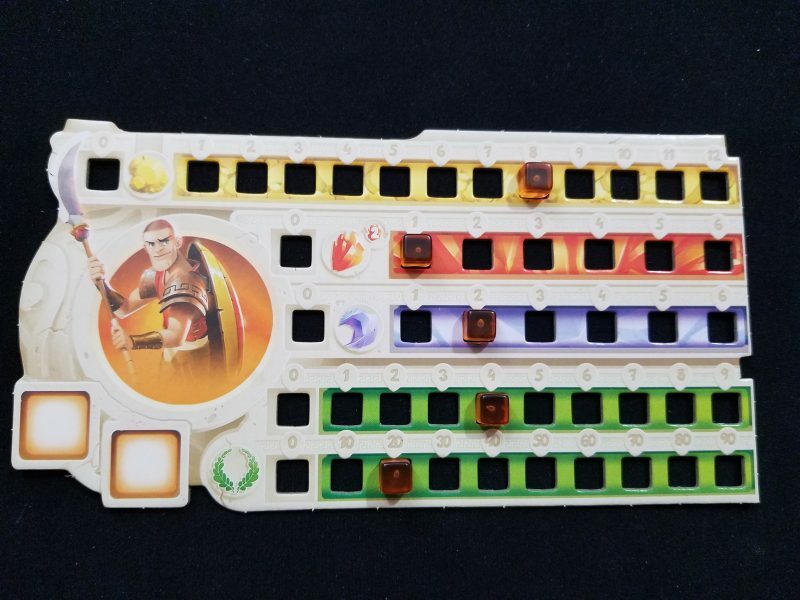 All of the little nuances and tricky decision points that you’ll find in a standard game of Dominion are present here, just with a bit less control over your outputs. It’s not a perfect game to introduce someone to the genre, however. 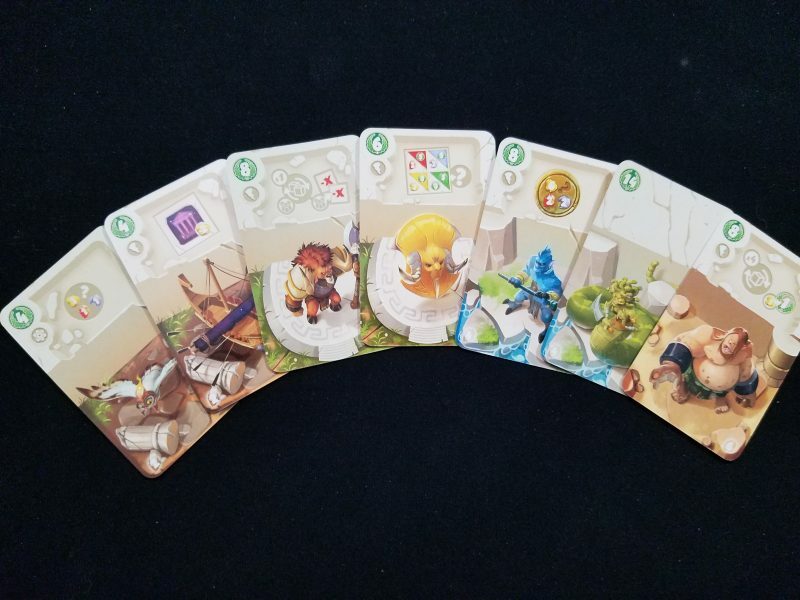 The setup and teaching are more involved than they should be due to sometimes-confusing iconography on the cards and no easy way to randomize the card selection. There’s not a whole lot you can intuitively figure out through the card iconography without consulting the rulebook, which makes explaining all of the cards slow and tedious. That’s not to say the game is long, as it finishes in around 45 minutes, but it feels like it should be shorter. In fact, this is one of the few games where I think a digital implementation would greatly improve it, as you’d be able to get a game done in about 5 minutes. Not only does the setup and tear down feel longer than it should, but a good chunk of the game is spent waiting for people to modify their dice. Since everyone always rolls on each player’s turn, you can’t simply move on to the next turn as soon as someone has made a decision of what to buy. I’ve found that the game slows down precisely when it’s least interesting (the first couple of rounds) because that’s when people are buying the most die faces, which take a bit of time to get used to replacing. In fact, that feels like the most significant bit of interaction in the game–simply making sure that you haven’t left someone behind. You want to race forward and execute quick turns, but the logistics of the game’s core system make that difficult. All other bits of player interaction intended by the game feel like a last-minute correction to an oversight. Sure, there are limited quantities of each card and die face, but that’s nothing special. The cards that make your opponents roll feel like an annoyance rather than a strategic attack, and the mechanism by which you can give an opponent a free roll by going to the card selection area of the board they’re currently located feels like interaction for its own sake rather than something that shapes much decision making. I have so many little quibbles and nagging annoyances with Dice Forge’s design, but I can’t help but have fun every single time I play. It has that addictive quality where you want to play again immediately after finishing just so you can try a different strategy you noticed. 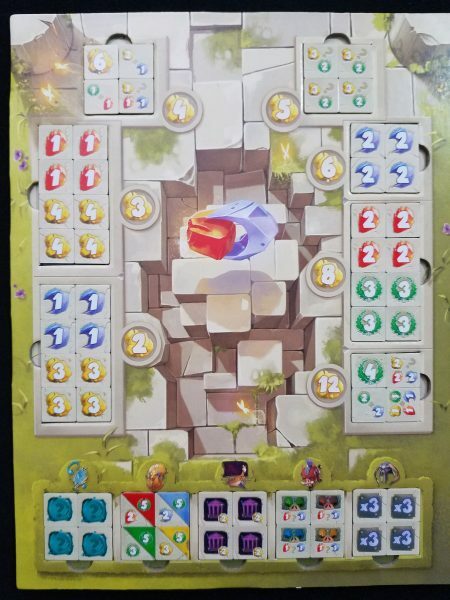 It has that tactile pleasure of rolling dice over and over again, which make you move cubes up on your player board to higher spaces. Just look at that wealth grow! It gives you that sense of anticipation as you build towards the more expensive, more powerful cards. The parts where you’re actually playing Dice Forge and not waiting for people are great. It’s short enough where even relatively inexperienced gamers can plot their potential end game before the first die has even been cast. There’s so much good in Dice Forge that my squabbles are extra frustrating because of how good I think the game could be. Or, at least, how good this system could be. Matt had an astute observation after one of our games when he said that, more than anything, Dice Forge feels like a proof of concept. Modifying dice is awesome! Can we see more of it? Can we see more designers playing with this concept? Perhaps something more strategically complex? 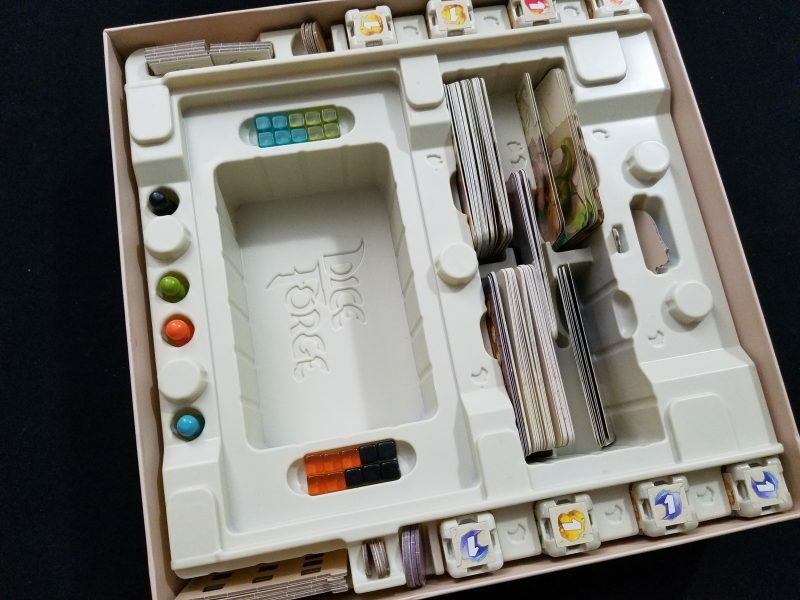 I’d love to see even more Dice Forge, actually, because the base game is desperately slim with variety. Every game you’ll have roughly ⅔ of the entire card selection in the box out for play. Where’s my deckbuilding variety? Where are the cool combinations and emergent strategies from mixing a bunch of abilities together and seeing what pops out? I mean, there’s certainly plenty of room in the too-big box for something. BGG says there’s an expansion scheduled for 2019. We’ll see. I can’t hate Dice Forge. I’m like a parent giving that child-devastating reprimand, “I love you and I’m not mad at you, just disappointed”. I’m harsh because it’s a blast. A sometimes shallow blast, befitting its bright, colorful, unmemorable art, but a blast regardless. It digs in and scratches that deckbuilding itch–scratch that–the building itch, so well. Everything I don’t like about Dice Forge is only frustrating because it’s contrasted with such a simple, fun, core.